A coral colony at One Tree Island, where the new experiment was conducted. As global temperatures rise, coral reefs are struggling—visibly. But while the link between overheated ocean water and reef death is well-documented, a new experiment is reminding scientists that the effects of ocean acidification could prove as catastrophic over the long run. 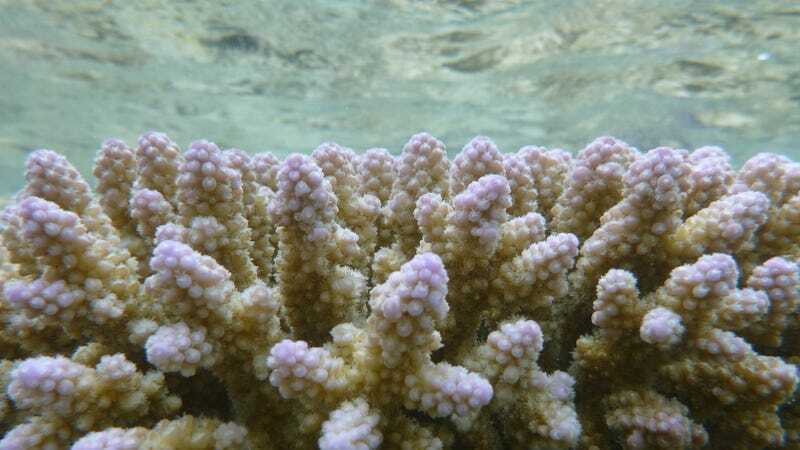 Writing Wednesday in the journal Nature, researchers have, for the first time, altered the acidity of a small section of a natural coral reef ecosystem to mimic conditions reefs will experience later this century. The result? A major decline in the ability of the ecosystem to form and maintain calcium carbonate, the steel and concrete reefs use to build themselves. While the results still need to be replicated, they’re a potent reminder that coral reefs will be struggling with the 1-2 punch of hotter temperatures and a more acidic ocean by century’s end, if not sooner. The ocean is basic, with an average pH of about 8.2 before humans got involved. By pumping billions of tons of carbon into the air each year, we’ve been driving that pH down. That’s because when carbon dioxide dissolves in seawater, it undergoes a series of reactions that boost the concentration of hydrogen atoms, increasing the acidity. Since the start of the industrial revolution, acidity at the ocean’s surface has gone up by 30 percent, according to NOAA. One effect of a more acidic ocean is a decrease in the amount of calcium carbonate it can hold. This is a huge problem for organisms that use calcium carbonate to build their exoskeletons, from corals to crustaceans to mollusks. It may already be causing some reefs to dissolve permanently. Previously, scientists tried to turn back the clock, decreasing the acidity of a small patch of the southern Great Barrier reef near One Tree Island, and enhancing coral calcification. In the new study, researchers returned to the same spot and turned the clock forward, bubbling CO2 across a patch of reef to drive acidity up. This drove the amount of calcium carbonate the water could hold down to levels we expect to see by mid-century. The result was a 34 percent decline in calcification across the entire coral reef community: Reduce the water’s ability to hold calcium carbonate, and less reef gets built. In the experiment, scientists released a plume of CO2-enriched seawater along with a dye tracer over a small patch of the Great Barrier Reef. One reason for the more dramatic field response may have to do with crustose coralline algae. These algae, which act as a sort of glue on the reef but aren’t present in many lab studies, are thought to be especially sensitive to acidification. “I think we’d love to replicate this across as many diverse oceanographic settings as possible,” she said. For now, the study’s results serve to remind us that today’s reefs are tuned to thrive in very specific chemical conditions. There’s also zero ambiguity as to why the oceans are becoming more acid, or how to address it.